Yesterday, Gloucestershire County Council’s planning committee voted unanimously to refuse a planning application to build a £500m waste incinerator at Javelin Park, Gloucester. Liberal Democrat leader, Cllr. Jeremy Hilton said: “I welcome the decision of the planning committee to unanimously refuse the planning application for a massive waste incinerator at Javelin Park. Liberal Democrats have opposed the project from the beginning. “We have tried to stop this project a number of times in the last few years by proposing motions at council and formal challenges to cabinet decisions to end the project. “On every occasion the Tories refused to listen to us. Under the reckless leadership of Mark Hawthorne the Tories just arrogantly pressed on with the waste incinerator project. They even agreed to sign a £500m contract with Urbaser Balfour Beatty ahead of the planning decision, leaving the council contractually committed to millions of pounds of costs in compensation if the project is cancelled. The Liberal Democrats have today officially launched their full Manifesto entitled ‘Caring for Gloucestershire’. The manifesto, which is split into nine key areas include money, jobs, people, environment, transport, safety, communities and countryside. The launch took place on the steps of Shire Hall amidst a number of key Liberal Democrat activists. In speaking about the manifesto, Liberal Democrat Leader Cllr. Jeremy Hilton said: “Our manifesto shows that a Liberal Democrat run council would care about what is important to the people of this county. It is our plan to make Gloucestershire a better place to live. “We believe that more can be done to improve the quality of services provided by Gloucestershire County Council. Ours is a plan that will help people across the county understand who we are, what we represent and what is important. The Liberal Democrats have today announced their top six priorities that will take them through to this year’s County Council Elections in May. The official launch of their full Manifesto will take place early next week. Further details of these and other policy areas will be published in the Gloucestershire Liberal Democrat 2013 Manifesto entitled ‘Caring for Gloucestershire’. The launch of this manifesto will take place on the steps of Shire Hall at 10am on Monday 11 March. “Our ‘six-to-fix’ priorities will benefit all those who live and work in Gloucestershire not just a select few. These top priorities along with our other plans included in the manifesto have been brought together by listening to the people of this county. “We believe that more can be done to improve the quality of services provided by Gloucestershire County Council. Our manifesto to be launched on Monday is a plan that will help people across the county understand who we are, what we represent and what is important. Liberal Democrats will invest in additional repairs to our roads and footways to repair the damage left after eight years of Tory neglect. We will release £5 million worth of surplus funds in the council’s reserves to help fix the enormous number of potholes on the county’s roads. The county council will work with the Local Enterprise Partnership to create more private sector jobs and apprenticeships. Liberal Democrats will support growing businesses to achieve their goals and will also work to establish new businesses in manufacturing, advanced technologies and the green economy. We have strongly opposed the building of a £500m waste incinerator at Javelin Park on environmental and economic grounds. We will seek to use more environmentally friendly technology to dispose of the residual household waste. A Liberal Democrat council will freeze on-street car parking charges across Gloucestershire. In residents’ parking permit zones Liberal Democrats will reduce the annual fee from £80 to £50. The Tories have slashed spending on Trading Standards by 50% at a time when the service is under greatly increased pressure with the controversy over horse meat in beef products. It needs to be in the forefront of testing food products on sale locally. There will be no further cuts in Trading Standards under the Liberal Democrats. We will lobby the government to establish a pathfinder project for a joint Gloucestershire fire and ambulance service under the control of the county council. Advisory 30 mph speed check signs have been erected along Tewkesbury Road in Gloucester to encourage motorists to obey the speed limit. 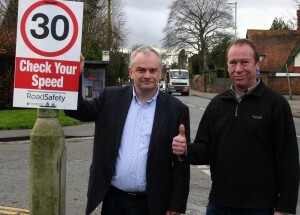 They have been installed at the request of Kingsholm & Wotton County Councillor Jeremy Hilton following complaints about motorists speeding along the road. 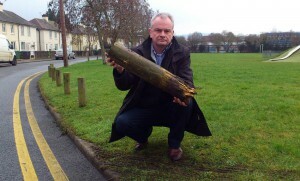 A large number of wooden bollards along the perimeter of Sebert St Rec’ are missing or rotten. They were put in to stop cars being parked on the Rec’ a problem that was evident on match days. On making a request for new bollards, Liberal Democrat Cllr. Jeremy Hilton was told that the city council policy had changed and that the bollards would not be replaced. Jeremy Hilton said: “I have written back to the council and demanded that the bollards are replaced to ensure the safety of children playing on the Rec’ and to make sure rugby fans don’t use the area as a car park. 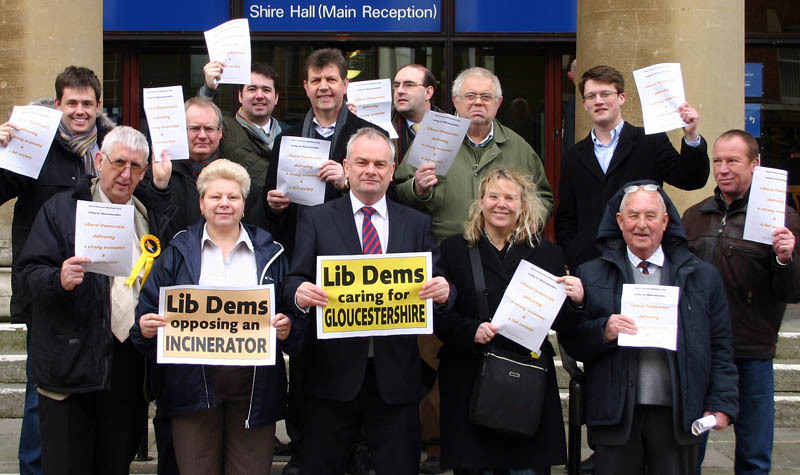 Liberal Democrats on Gloucestershire County Council will at February’s full council meeting call on the Tory cabinet to cancel the massive incinerator project due to evidence of over-capacity. A report published in November last year by Eunomia Research shows that many regions of the UK may reach over-capacity of residual waste treatment by 2018. The proposer of the motion, Liberal Democrat leader Cllr. Jeremy Hilton said: “Eunomia’s research is alarming in that since the last report undertaken six months ago there has been a significant rise in applications for additional tonnage of waste treatment capacity. “Such a position means that the UK now has 7 million tonnes more consented residual waste treatment capacity than is requiring treatment. “By steadfastly pursuing this project the Tory-controlled council is not only going against public opinion, but is also contributing to an over-capacity crisis. This is madness. Cllr. Hilton continued by saying that: “We will continue to insist that there is an alternative to the building of a ‘mass burning’ incinerator at Javelin Park such as Mechanical Biological Treatment (MBT). Also commenting, Cllr. Mike Collins (LD, Brockworth) said: “I will be seconding this motion next month in order to stop the futility of such a project going ahead. “When will the Tories on this council start listening to the people that they represent and those several hundreds who have already signed the online Government petition asking national politicians to challenge the incinerator’s planning application. The motion will be debated and voted upon at the next full council meeting in Shire Hall on Wednesday 20th February 2013 at 10am. “This council notes the report on residual waste capacity published by Eunomia on the 30th November 2012. The report indicates that the UK now has 7 million tonnes more consented residual waste treatment capacity than there is residual waste requiring treatment. Liberal Democrats on Gloucestershire County Council have come out condemning the Tory administration after it has been revealed that the total costs of the Judicial Review held in September 2011 was not far short of a quarter of a million pounds. A High Court Judge back in November 2011 halted Gloucestershire County Council’s proposals for failure to undertake a proper Equalities Impact Assessment. The Tory-controlled council went back to the drawing-board in January 2012 with new proposals to cut funding to seven Gloucestershire libraries. The total cost of the legal challenge amounted to £238, 317.61, which included both in house and external legal costs for the council. Liberal Democrat group leader, Cllr. Jeremy Hilton said: “During a time of great austerity, the costs that have been incurred through this legal challenge was needless, wasteful and nothing short of reckless. “Last night’s meeting at Gloucester City Council was interesting. Our no confidence motion in the Tory administration was defeated by a combined vote of Tory and Labour councillors. Gloucester is one of two councils that haven’t filed audited accounts for 2011/12. The detail presented in the Tory draft budget for next year is also palpable. The council is facing a financial tsunami. When it came to it, Labour bottled it, and saved the Tory leader’s neck. Later the Tories voted against a Lib Dem amendment praising the coalition government for raising the income tax threshold to £9,440 from April this year, saving the average earner £600 per year, compared to income tax bills under Labour. Halting the financial tsunami – Liberal Democrats demand answers! A high level meeting has been held between the leadership of the Liberal Democrats and the Conservatives on Gloucester City Council, to try and resolve the financial crisis engulfing the council. Currently, the Tories are in charge of the council, but are facing a vote of no confidence on the 24th January because of the council’s failure to complete audited accounts for 2011/12. The no confidence voted is being proposed by the Liberal Democrats. Liberal Democrat group leader, Jeremy Hilton has described the council as facing a financial tsunami because of its failure to complete audited accounts for 2011/12. The accounts should be used as a base to predict income and spending for the forthcoming financial year and in helping to set the council tax. The Liberal Democrats have issued the leader of the council Paul James with a ten-point demand (see below) for information covering every aspect of the council’s finances in order that a sound budget can be set for 2013/14. 5. Full list of virements between budget heads made in the current financial year over £5,000. Financial Tsunami at Gloucester City Council The Tories should go! The Conservatives who run a minority administration on Gloucester City Council face a vote of no confidence on the 24th January, which if passed, would see the sacking of Paul James as leader of the council and his cabinet. The no confidence motion will be moved by the Liberal Democrat group. Gloucester City Council is only one of two councils in the country that has failed to sign off its 2011/12 accounts, the other is Birmingham. Both councils have been named and shamed by the Audit Commission. Audited accounts should have been completed by the 30th September 2012. They are used as a base to predict income and spending for 2013/14. It is understood that independent auditors KPMG are investigating the council’s books but still cannot get the figures to add up. “That this council notes that the Conservative administration has failed to present, on time, audited accounts for the financial year 2011/12. This should have been done by the 30th September 2012 deadline. This council notes it has been named and shamed by the Audit Commission (15th Dec 2012) as only one of two councils in the entire country to fail to complete its 2011/12 accounts.